In a world where everyone is born with some level of magical ability, two newborn babies are left on the doorstep of a village church. The local priest names them Yuno and Asta. As they grow up, Yuno develops amazing magical powers. However, it would appear Asta has no magic power whatsoever, something which is almost unheard of. Despite his lack of powers, Asta still holds strong his dream of one day becoming the Wizard King. When he's finally bestowed a special Grimoire, it looks like he might finally be a step closer to his destiny. 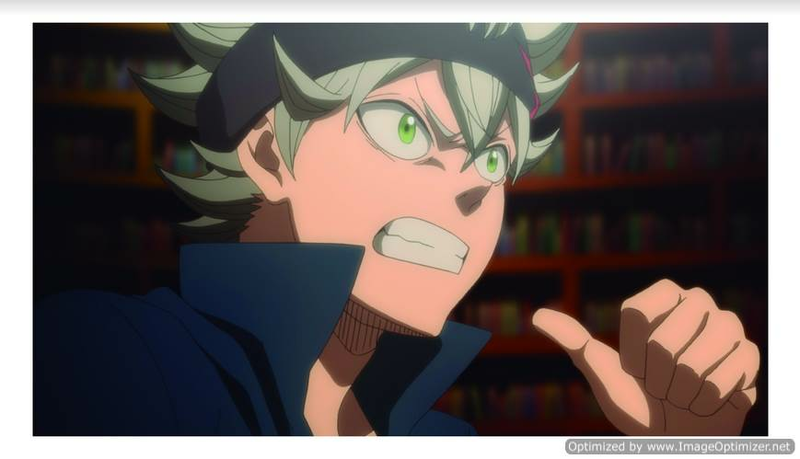 The latest hit anime series to reach the UK, Black Clover shares a theme with the previous anime series we covered, My Hero Academia, as both deal with young protagonists out of place in their outlandish worlds. Just as Deku was (initially) devoid of any superpower in a world where everyone has a superpower, Asta is (initially?) devoid of any magic powers, in a world where even the farmers use magic to harvest their crops. There are however major differences in the way each series tells their story. I have to admit I found the first few episodes of Black Clover hard going, which is down to two things. Firstly, the character of Asta is incredibly obnoxious! Ever since he was young, he's had this notion to become the Wizard King but as he's grown (he and Yuri are now 15), his lack of magic ability has given him a huge chip on his shoulder. Not only that but he's infatuated with Sister Lilly, a nun who helps out at the Church and repeatedly demands that she marry him. Yes he's tenacious but he acts like a bit of an obsessive nuisance and shouts all his dialogue. I checked both the English and Japanese versions and he sounds just the same. Meanwhile his brother, Yuri, has an almost pious attitude. Things come to a head at the Grimoire ceremony, where everyone of age is bestowed with a magic Grimoire (as with Hogwarts students and their wands, the Grimoires choose their new owners). Yuri is given the infamous four-leaf clover Grimoire, such as owned by the very first Wizard King. To make matters worse for Asta, he doesn’t even receive a Grimoire in the ceremony. Things start to perk up, not just for Asta but also the viewer. Yuri shows a hitherto unseen brotherly side and the viewer starts to see that Asta isn't just enduring ridicule because of his lack of magic, but also his status in life. This is exasperated when the pair reach the big city and face prejudice on every side. Despite his obnoxious roots, Asta does grow on you, and it becomes compelling entertainment to watch all the high-borne aristocrats totally underestimate the pair and get their comeuppance again and again. This is especially true when Yuri is challenged to duel as part of the entrance exam to the Magic Knights. The other element which makes Black Clover difficult to get into is the amount of repetition contained within each episode. Each starts with the final few minutes of the previous episode as well as some background exposition about the first Wizard King. It would have been nice to have a branching option to skip past the prologues and credit sequence, to aid binge-watching multiple episodes. And that's the thing - despite my early misgivings about the series, I ended up watching all ten episodes in two sittings. There are some really cool nuances to the story, characters prove to be deeper than expected and as I mentioned earlier, there is a deep satisfaction to watching both Asta and Yuri succeed in this secretly oppressive society (by the end you're wondering who's going to have a tougher time of it - Asta with his lack of magic, or Yuri who's outstanding magic ability brings more focus on his low-borne status). Black Clover is a series which sells the idea that anyone can achieve their dreams, despite their position in life, through hard work and tenacity - and you can't help but want to watch Asta and Yuri succeed, especially when you see the arrogance and prejudice steeped against them. The structure of the episodes isn't great and suits a weekly show, rather than binge-watching, but even so I found myself watching episode after episode in one sitting and definitely want to know what happens next..